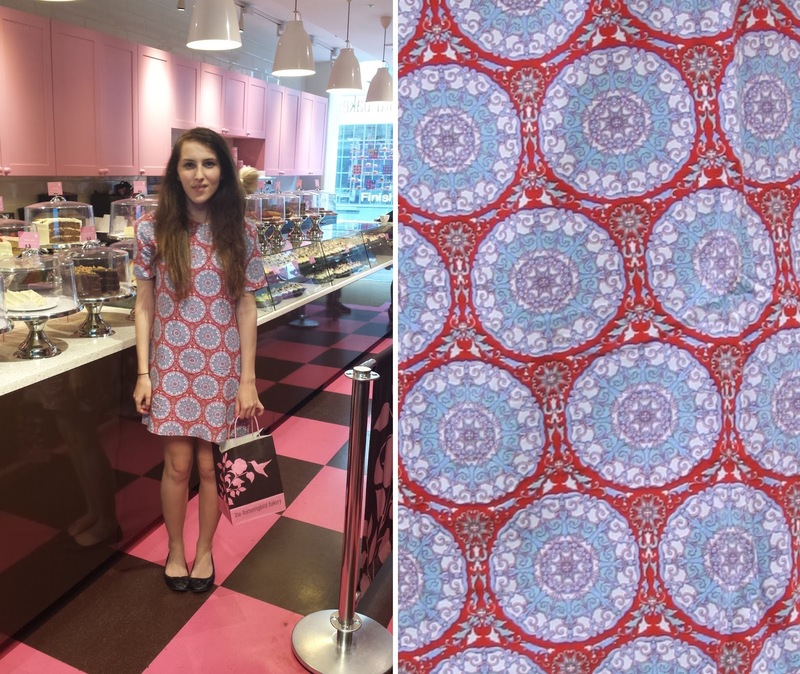 Last week I was very lucky to be invited down to the Hummingbird Bakery (Soho branch) for the first time ever and given a few cakes to try! 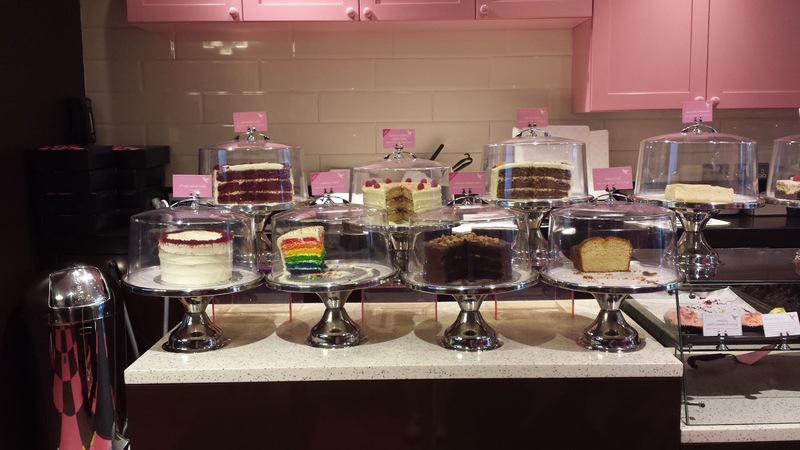 Having walked past it a couple of times recently, I already knew it was a cute little pink shop but going in an having a look at all the amazing looking cakes was quite an experience! 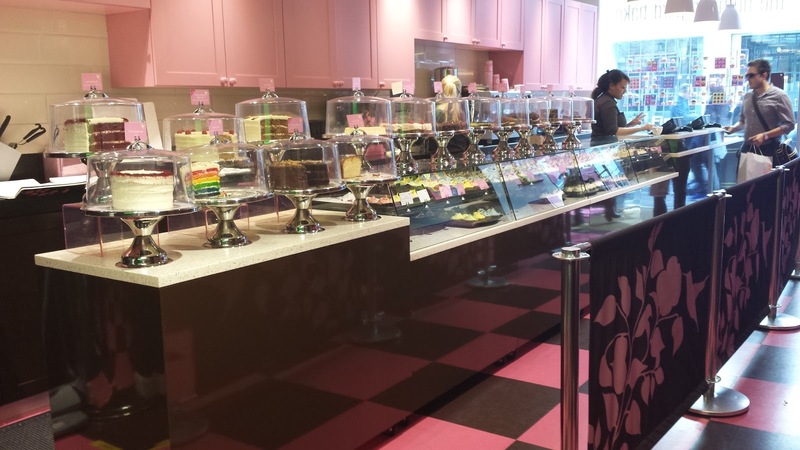 Everything looked amazing, there were rows and rows of cupcakes and then a big collection of big cake stands at the end with the most amazing looking cakes I've ever seen plus whoopie pies and tray bakes! The first one that I was drawn to and had to try was the rainbow cake, I have attempted to make one before and it was a big failure to I was a little star struck or cake struck to see such a perfect one with such bright colours and very defined lines, the cake itself was very moist and tasted rather normal - I was expecting it to taste like food colouring considering the craziness of its colour, but it was a really lovely sponge! I was also super shocked that the icing wasn't just plain vanilla like I was expecting but super sweet bubblegum flavour. The next cake didn't need thinking about, even before I had arrived, I knew that I had to try one of their red velvet cakes, no questions asked. 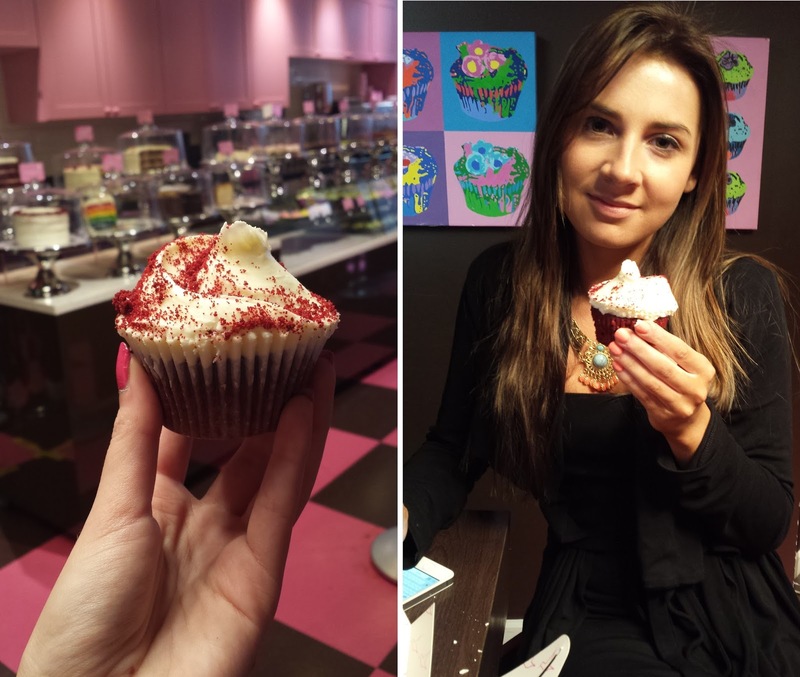 I couldn't leave without trying one of the pretty cupcakes so this time I went for a red velvet cupcake rather than a big slice. My friend, Alice met me after work so we tried that one together, she was actually the one who mentioned their red velvet cakes to me in the first place so she was the right person to try it with! 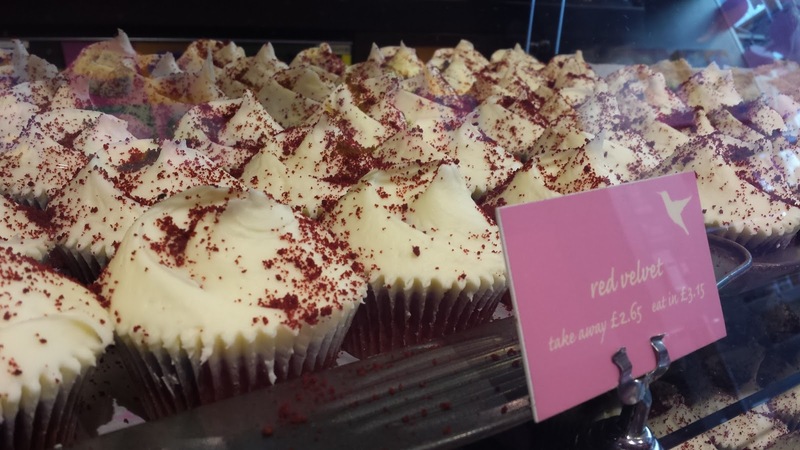 It was just as amazing as I'd heard, lovely moist sponge with loads of amazing cream cheese icing - red velvet is taking over and is definitely their most popular - I can see why, its now my flavour of choice too! The staff in store were lovely and very helpful, after spending the afternoon sitting in there watching the world go by, I soon learnt that although it's super busy and there were people dropping in all afternoon, they knew their customers very well! Alot of their conversations finished with see you tomorrow at the end and for others who were just as unfamiliar as me, they staff knew their stuff, one lady popped in to pick up some cupcakes for catching up with her friend that night and asked one of the girls about alot of the cakes, she knew every exact details of each cake, it was very impressive. 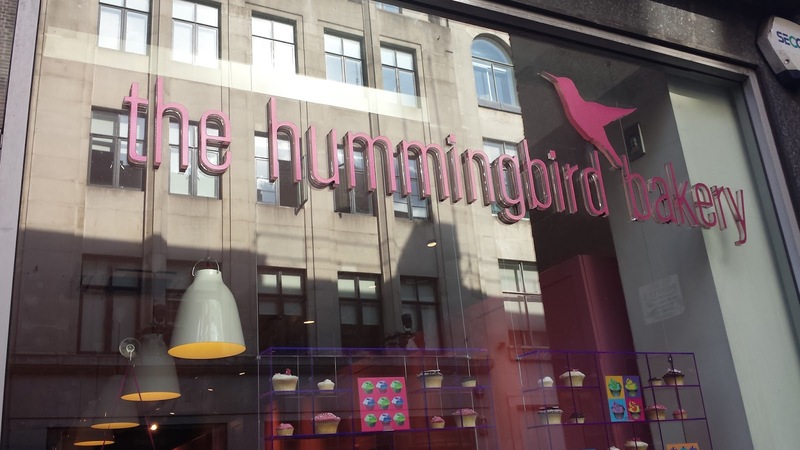 Huge Thanks to the Hummingbird Bakery for a lovely afternoon and starting my new addiction! I will be popping in every time I walk past from now on! 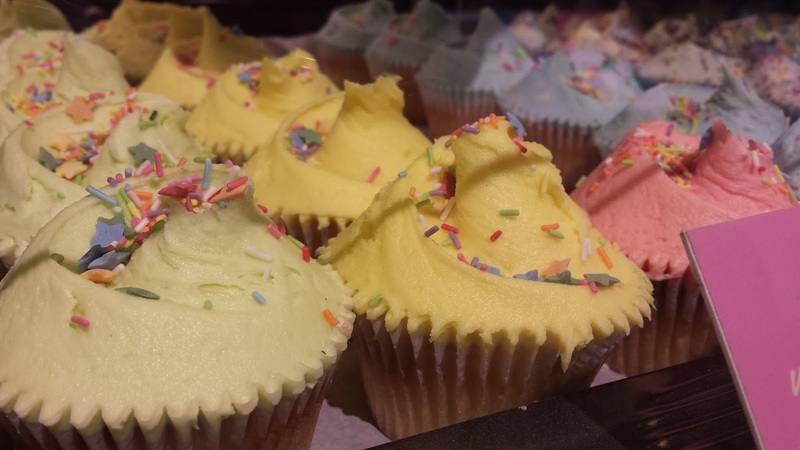 Great photos and lovely cakes, must pay a visit when I am next nearby. Irrisistible! 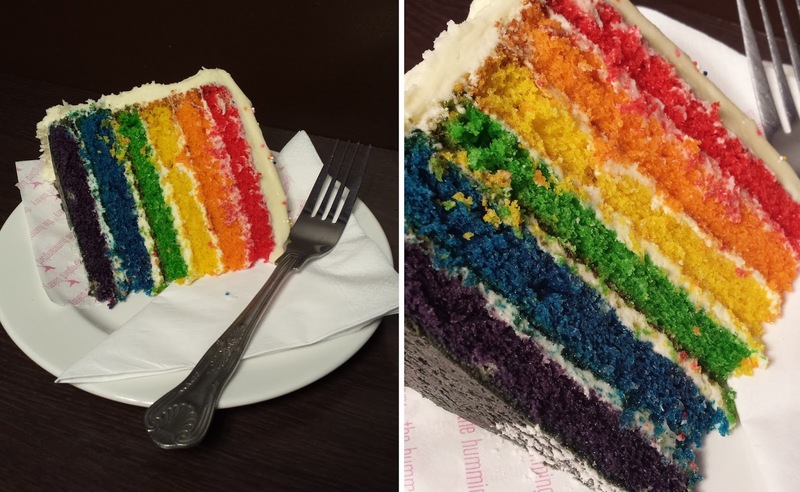 I NEED to try that rainbow cake! !